Freshman Courtney Garcia is feeling lucky tonight. Hours after a storm ripped the roof off her dorm at Arlington Baptist College, she returned to the place she called home this semester, with a cast and bandages. She was among about two dozen young women inside the dormitory Thursday afternoon when the roof was violently slapped off the building by intense winds. “I was like, 'I need to move,' and right when I moved, the glass just broke in and shattered. I had to put my hand up to see like it wouldn’t get in my face and I had a really deep gash on my ankle,” Garcia said. 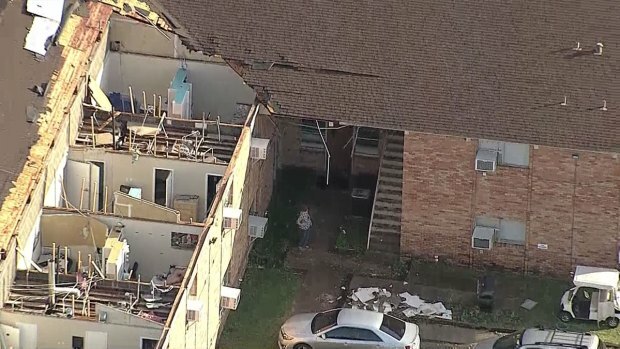 Thursday afternoon's storms ripped the roof off a dorm at Arlington Baptist College. The girls huddled in a bathroom as the storm passed. Fellow neighbors helped her wrap her wounds to stop the bleeding. Now, as she surveys the damage, she feels lucky. Lucky she’s not hurt worse, and that her friends and neighbors are all safe. “I think God had His hand on us, and it could have been a lot worse if we didn’t get out on time. I just feel like we're all really lucky,” she said. The young women will be placed in other dorms or hotels while Arlington Baptist College figures out what to do with the building. Usually around 60 girls live in the dorm, but many were gone for a long weekend, since the school is closed on Friday.